The bell has a long history in China. It is an embodiment of Chinese culture and science, and testifies to the wisdom of Chinese people. beautiful bells are of excellent workmanship. Because of the cultural and scientific and technical information contained in them, their excellent musical quality, and the profound acoustic principle adopted in them, those bells amazed the archaeologists, music historians and science historians. With decline of the ritual of the Zhou Dynasty, the bell－chime gradually stepped down because of the complicated manufacture process and high cost they evolved. In the Eastern Han Dynasty (hàn cháo 汉朝), from AD 25 to 220, Buddhism was introduced into China and the native Chinese religion Taoism came into being. Bells began to be used in Buddhist and Taoist monasteries as musical instruments for religious ceremonies. The depressing tone suggests a traveler's homesickness. But Dai Shulun sang a flamboyant melody, "At the jingling bell from the royal gardens / On the capital outskirts the morning glows." The most famous Buddhist bell is the Yongle Bell in the Dazhong Si or Big Bell Temple in Beijing. It was produced when the emperor Zhu Di named his reign Yongle and moved the national capital to Beijing. 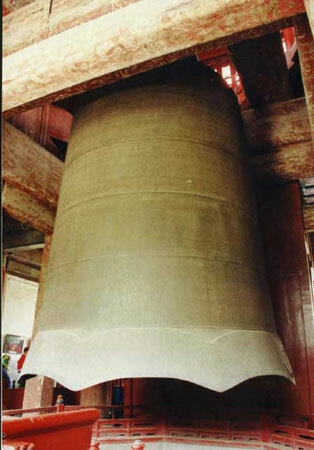 The 46－ton bell is 5.56 metres high and 3.3 metres in its outer diameter. The bell with clear patterns is covered with passages from Buddhist scriptures inside and outside. The passages are in neat and clear characters without any error. The bell gives booming, lasting emotive sound. After the Tang Dynasty court audience bells and watch bells came into use. The court audience bell is used to announce the dignitaries' merits. The watch bells are used to tell the time at night. Beijing has a Bell Tower and a Drum Tower. Over the centuries in the Ming and Qing dynasties, people used to hear 108 bell－tolls and drum－beats every other hour at night. In those days Beijing people slept to the accompaniment of bell and drum sounds. The bell in China bespeaks a long－standing tradition. Chinese people are proud of these rare ancient bells. The bell offers artistic and scientific treatment to generations of people.